Remodeling the Bathroom with new Tile or Stone can dramatically breathe new life into your home. Our team of professional installers will take their time and work to meet your exacting specifications. Blue Ridge Tile offers custom tile work for any budget, providing you with endless possibilities. There are virtually an unlimited number of ceramic tile combinations possible. The first thing visitors notice when they enter your home are the immediate surroundings. 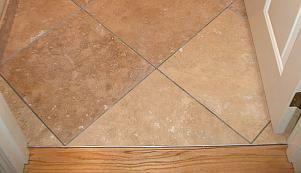 Not only will a new interior floor increase your homes value, it will also reflect your personality. 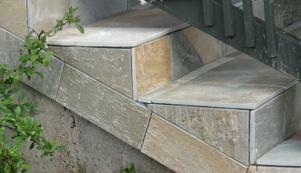 We also offer a great selection of outdoor flooring. The experts at Blue Ridge Tile are experienced with the latest techniques for helping you realize your exterior flooring dreams. Whether it be simple or complicated, call us. 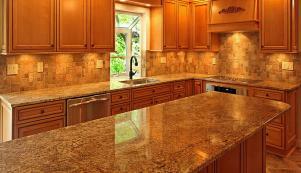 Selecting the correct counter system is one of the most important decisions you make when you are remodeling a Kitchen or Bathroom. The specialists at Blue Ridge Tile are trained to assist you in making tough decisions easy. Combine a designer's keen eye with a stone artisan's skilled hands and the possibilities for creating a uniquely personalized hearth are virtually endless! A good fireplace design brings a room to life. 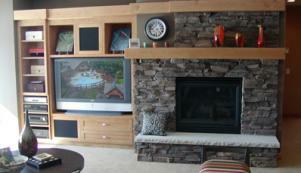 Contact us today for your custom stone fireplace.